Two…For a family of flyers (like us) who have to cart an infant car seat from one continent to the next, large plastic bags at baggage check can generate a surprisingly high level of goodwill. This is a common item provided by real airlines, sort of like water and pretzels. Yours is the first to suggest we just throw our infant car seat into the luggage hold without any protective covering. Obviously your damaged baggage insurance policy is rather generous and it is cheaper to compensate travelers for an important piece of kit like this, than to provide a cheap plastic trash bag as courtesy. Three…As a business traveler I use to hate traveling on flights with babies on board. I admit I would roll my eyes heavenward when I saw some frustrated parent overloaded with diaper bags in one hand and an unhappy infant in the other. Then I became one of “those people” and an epiphany struck – passengers very naturally get annoyed with crying babies (no one likes to be stuck on an international flight with a wailing child), however babies cry more when their parents are stressed out, parents are stressed out because airlines like yours do very little to accommodate. So how about allowing parents with children to board first. Yes, first. Even before your First, Business, Premium and Priority status passengers. This may appear counterintuitive but there is sound, self serving logic to this. It avoids having your expensive fare paying customers getting bopped and bumped by parents like us as we shuffle apologetically past business men and women drinking pre take off champagne. Parents (and therefore kids) are less stressed, kids/babies pick up on the happy vibe and are less likely to fuss, elite customers can enjoy their beverage of choice without spillage and the balance of the force is returned to the universe. Four…Once the plane has taken off, reaching a safe cruising altitude and the seatbelt sign has been switched off, it would be super helpful to have someone from your customer service team attach the baby bassinet immediately, before you start serving drinks. I promise it will only delay drink service for no more than 30 seconds, and allows the trolley to better roll down an unblocked aisle to deliver refreshments to thirsty passengers without having to navigate an infant, seat table, glass of water and unlatched bassinet frame in a weird cirque du soleil maneuver. Five…Speaking of baby bassinet, you may want to add that to the list of things that your cleaners attend to, or even better provide a freshly laundered one like your peers at Cathay Pacific. As much as I appreciate your contribution to my son’s growing immune system, I didn’t think it was prudent to let him inhale leftover crumbs and what not from the last baby that used it or perhaps the last person that mistook it for a place to discard trash. Six…At the risk of sounding like a precious mum, it would also be useful to have an infant seatbelt for my baby. I know my baby son is a bit of a freeloader and we only paid a 10% fare plus taxes for his privilege to sit on my lap. I would still like to think that you value my son’s well being as equally important as the other full fare paying passengers who must wear their seatbelt for safety reasons. Other grown up airlines provide infant seat belts for use during the flight. Although I periodically do strength training at the gym, your sagely advice to “have him on your lap and hold onto him tightly for takeoff” will only go so far. If we were to encounter difficulties during our ascent I doubt my heroic efforts to prevent him from smacking into the bulkhead wall would hold up to much at 130 – 150mph, let alone rough turbulence whilst we are airborn. Just in case you need to convince the bean counters in your organization to approve a requisition order, you may want to think of it this way – if my son remains safe on your flights, he will grow up to be nice and healthy, and one day he will be a grateful paying customer. There’s your return on investment. Seven…My last baby related suggestion (I promise) is to adjust the design of your 1980’s style bassinets. The carpet blue and steel look can be enhanced by adding some sort of hood or covering. Before you dismiss this as a mother’s crazy rant, hear me out. 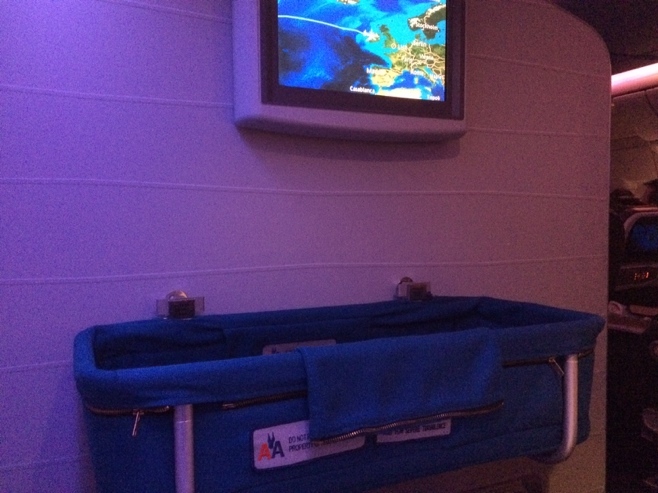 Your bassinets sit right under that riveting display monitor that shows the flight path, time to destination, outside air temperature and all manner of very useful information. This is illuminated throughout the entire flight. It means the poor little soul who is placed in the bassinet has to fight really hard to get to sleep. I’m sure you would also struggle to snooze if your bed was placed under all the shining lights on the Vegas strip. Remember point number three? That virtuous circle of happy baby, happy parents, happy passengers applies equally here too. Eight…As stewards of industry and proud representatives of the all-things-American brand, you may want to relook at your dining choices. Two types of sloppy cheese or cream covered pasta for dinner? 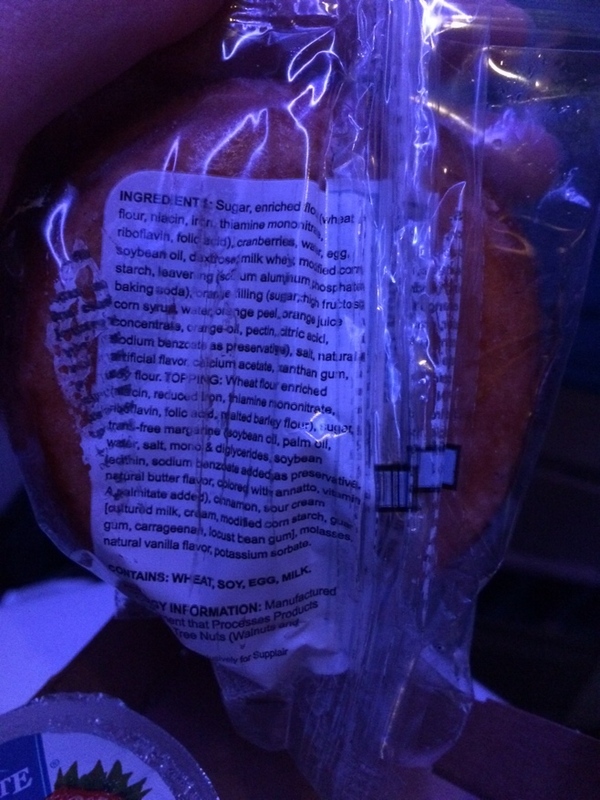 A breakfast snack box totalling almost 600 empty calories which includes an orange muffin thing that has sugar listed first and an ingredients list that reads like it was concocted in a science lab? Really? Perhaps you’ve heard of the obesity epidemic? How about helping to turn the tide by offering real food and fresh fruit. We would really appreciate it and you could eventually make more money as we would remain trim and you could squeeze more passengers into economy by further reducing the seat width and shortening leg space. Nine…Treat your employees nicer. As much as we love overhearing closed curtain galley gossip about the most recent thing “the company” has done and how “corporate” is evil, it really doesn’t reflect well. You employ many kind, smart people who not only get us safely from one destination to the next, but they are also your ambassadors. How they feel about your company ultimately determines how we feel about buying services from you. Please don’t go down the crazy ‘we need more customer service training’ route – that is just a reeducation camp in diguise – you may want to look at simple yet important things like respect and values and perhaps your own staff would not be lobbying customers like me to write letters like this (and we come full circle back to point number one).